Market Outlook - Outlook 2016 | Rocco & Associates Wealth Management, Inc.
U.S. economic growth of 2.5–3%. The mix of that growth may look different than in 2015, with manufacturing, business capital spending, and net exports taking larger roles. Labor markets are almost back to long-term expectations, and inflation may be poised to accelerate. An extraordinary extended period of loose monetary policy in the United States should start to normalize. Mid-single-digit returns for the S&P 500. Stocks, we believe, will not collapse, as many think, or soar, as many hope, but may offer near historical routine returns. Earnings may start to normalize, and oil markets should find their equilibrium. International markets may re-emerge as a more viable investing opportunity. But we are still in the second half of the economic cycle, and investors need to be vigilant about monitoring pockets of volatility and potential signs of an economic downturn. Limited returns for bonds. The year as a whole may look similar to 2015, with bond prices facing the challenges of high valuations, steady economic growth, and the prospect of interest rate hikes. Still, bonds play a vital role in investors’ portfolios to help with risk mitigation and diversification. 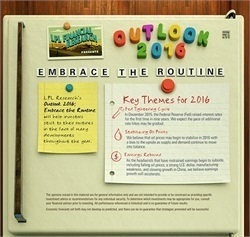 We believe LPL Research’s Outlook 2016 will help investors refresh, renew, and embrace their routines in the face of unexpected developments and a changing environment. By embracing new routines, investors will be able to focus on what matters most to markets, block out short-term distractions that will quickly fade, and seek to make progress toward long-term financial goals. Our forecast for GDP growth of between 2.5–3% is based on the historical mid-cycle growth rate of the last 50 years. Economic growth is affected by changes to inputs such as: business and consumer spending, housing, net exports, capital investments, and government spending. Historically since WWII, the average annual gain on stocks has been 7–9%. Thus, our forecast is in-line with average stock market growth. We forecast a mid-single-digit gain, including dividends, for U.S. stocks in 2016 as measured by the S&P 500. This gain is derived from earnings per share (EPS) for S&P 500 companies assuming mid- to high-single-digit earnings gains, and a largely stable price-to-earnings ratio (PE). Earnings gains are supported by our expectation of improved global economic growth and stable profit margins in 2016.